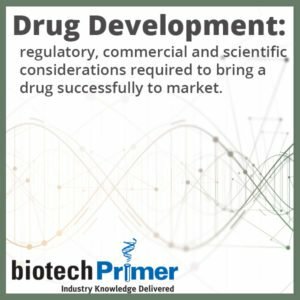 “Post-translational modification” may not be a term you hear every day, but it is critically important to the biotech industry—from understanding how cancer develops to producing biologics. So, a post-translational modification (PTM) simply means that after a cell makes a protein, a change is made to that protein. As you know, DNA provides the instructions to the cell to make a protein, however, that is not the whole story. Often modifications are necessary for the protein to fold into its correct shape and function properly. These changes occur during the process of post-translational modification. 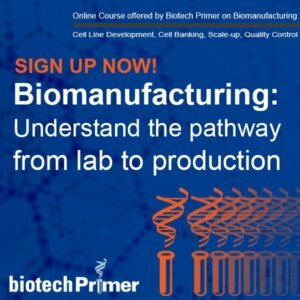 In this WEEKLY, we’ll explain the most industry-relevant post-translational modifications and examine how PTMs impacts everything from biologics to biomanufacturing. Two of the most important PTMs are phosphorylation and glycosylation. Phosphorylation is the addition of a negatively charged phosphate group to a protein. This phosphate changes the shape of the protein; in most cases, this shape change turns the protein “on” from an “off” state. 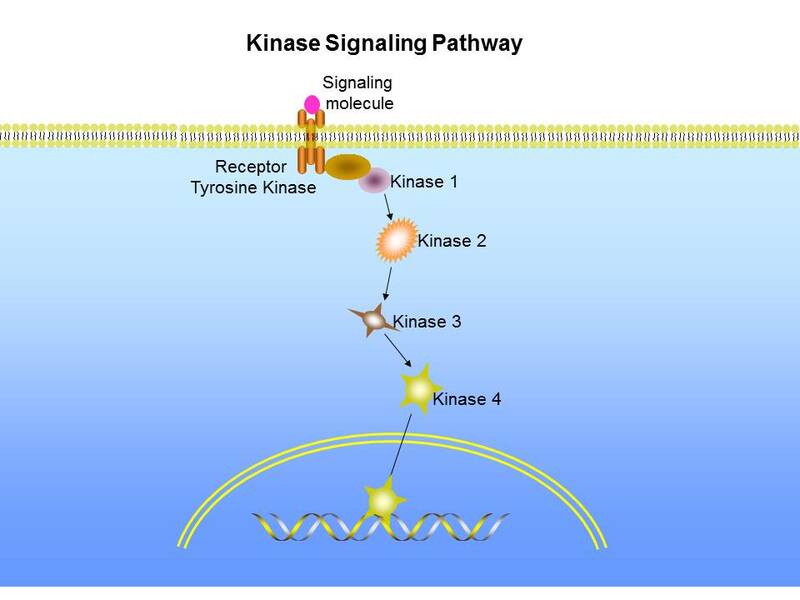 The enzyme that adds the phosphate group is called a kinase and kinases play a critical role in different signaling pathways. Glycosylation is the addition of a sugar group (carbohydrate) to a protein. The sugar ensures proper protein folding and increases protein stability. The enzyme that adds the sugar group is called glycosylase. As we’ll discuss below, glycosylation is critical for monoclonal antibody function. In fact, all antibody therapeutics must be produced in mammalian cells and not bacterial cells, because mammalian cells have glycosylase and bacteria do not. Phosphorylation is important in regulating cell growth and division. Cell growth and division are regulated by growth factor receptors, which are proteins found on all cells. Growth factor receptors pass through the cell membrane and have an external and internal domain. This transmembrane protein allows the cell to take in messages from the outside of the cell and pass them on to the inside of the cell. 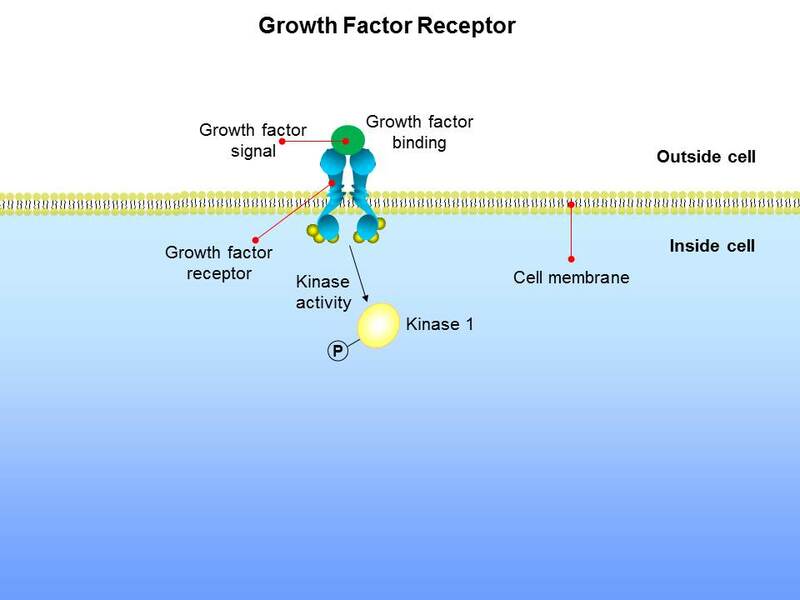 After the binding of the growth factor to the receptor, the growth factor signal activates the the first kinase. Once the external domain binds a growth factor signal, an internal signaling cascade begins. The cascade usually involves the addition of phosphate groups by kinases to a succession of proteins. The cascade ends when the last activated protein enters the cell nucleus and instructs the DNA to make the proteins required for cell division. 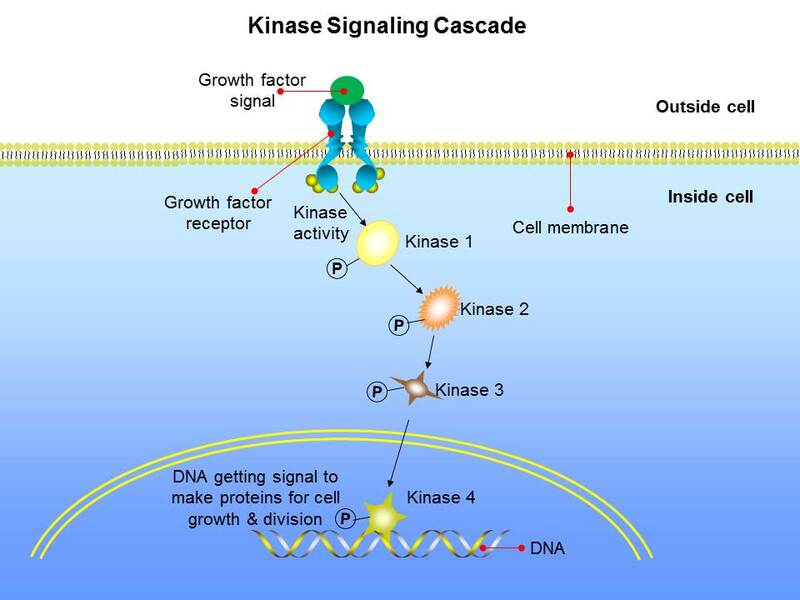 The signaling cascade involves kinases adding phosphate groups to the succession. Once the domino effect meets the nucleus, the instructions to initiate cell growth and division are received. Since cancer is uncontrolled cell growth, many different types of cancer are associated with problems in signaling cascades. For example, a mutation in one of the kinases may cause it to be permanently “on.” This non-stop activation means the DNA is always getting the signal to make proteins that cause the cell to grow and divide. This constant cell division eventually results in a tumor. Alecensa (Roche, Basel, Switzerland), approved in 2015 for non-small cell lung cancer. Tagrisso (AstraZeneca, Cambridge, England), approved 2015 for non-small cell lung cancer. Cotellic (Exelixis and Genentech, South San Francisco, CA), approved 2015 for advanced melanoma. Glycosylation is of particular importance to the shape, stability, and function of monoclonal antibody therapeutics (mAbs). Many mAbs approved for cancer work by recognizing and binding to a protein on the surface of a tumor cell. This binding attracts white blood cells, such as macrophages, to attach to the mAb and destroy the antibody-tumor cell complex. Because the white blood cells recognize mAbs based on their glycosylation pattern (i.e. the specific type of sugar groups attached and the location of the attachments), changes to the glycosylation pattern may increase or decrease the drug’s efficacy. One prime example is Roche’s (Basel, Switzerland) leukemia drug Gazyva. Gazyva has significantly better clinical efficacy than Roche’s earlier drug Rituxan, even though both drugs target the same protein on blood cancer. This is because Gazyva has a different glycosylation pattern than Rituxan, making the antibody-tumor complex more recognizable by macrophages. This new glycosylation pattern was achieved by producing Gazyva in a mammalian cell line that has been genetically engineered to overproduce two alternative glycosylation enzymes, changing the structure of the sugars attached to the mAb. Speaking of cell lines, Catalent (Emeryville, CA) has engineered another type of cell line to produce a desirable post-translational modification. Unlike glycosylation, this modification is not common in nature; rather it is a clever way to create monoclonal antibodies that can be used for the targeted drug delivery of small molecules, toxic chemotherapeutics, peptides, RNA, DNA, or other proteins. Dubbed SMARTag, the cells are engineered to overproduce an enzyme called “formylglycine-generating enzyme” (FGE). FGE converts the amino acid cysteine to the amino acid formyglycine, which is not normally found in proteins. Formylglycine contains an aldehyde group, which can be used to attach whatever molecular entity needs to be delivered to a diseased cell. The specificity of this reaction ensures that attachment occurs only at the formylglycine sites, creating a uniform, stable product. SMARTag technology is a type of antibody-drug conjugate technology (ADC). 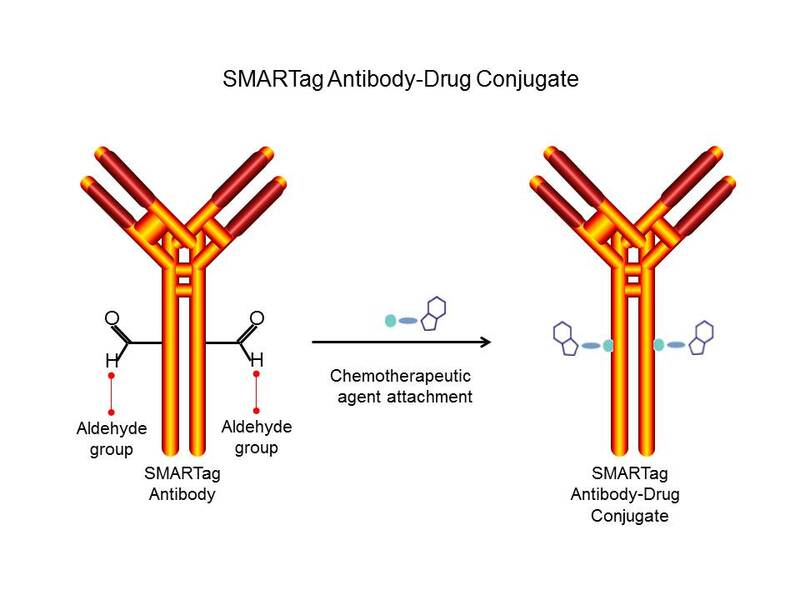 The Y-shaped SMARTag antibody above shows how the formylglycine containing aldehyde group can be used to attach a drug after administering a chemotherapeutic agent, turning it into a Y-shaped antibody-drug conjugate. From glycosylation to phosphorylation, post-translational modifications have a significant impact on protein function, illustrating once again the complex nature of proteins and protein-based therapeutics. By fully understanding PTM, drug companies can use this process to their advantage to create more effective products.